In a way, I wish this wasn't the first session in which I could take part. Collaborations in artwork are really cool things, and I'm sure there are some good ones in the beer industry. 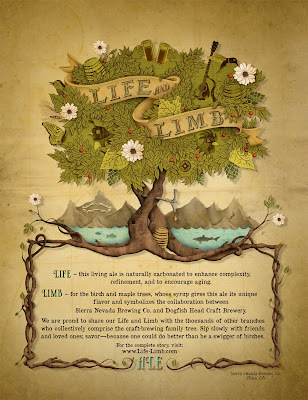 But I haven't been doing this for long enough to get a good writeup of one, so instead, I'll write about the artwork of a collaboration beer, the Life and Limb. The collaboration is a well-known bicoastal one between Sierra Nevada and Dogfish Head. The poster below shows the artwork for the beer, done by Jason Roberson and the Sierra Nevada art department (This piece will appear in the show next month, if you're wondering). 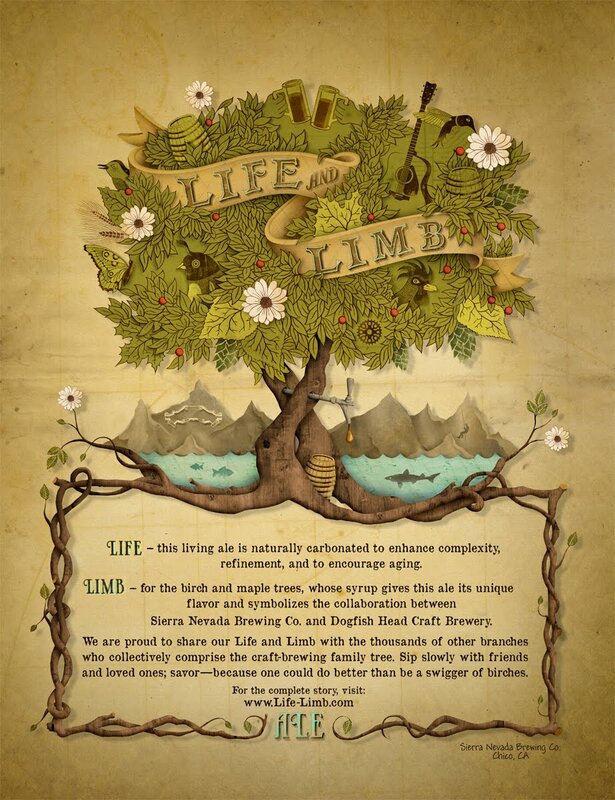 I believe the beer at Dogfish head was actually called the "Limb and Life," but it was draught-only and so had no real artwork of its own to speak of. This image was the visual identity of the beer nationwide. 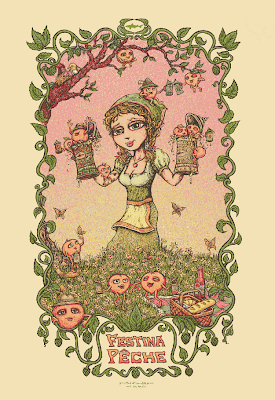 The style is noticeably that of some of Sierra's other recent work, focusing on a sort of storybook naturalism. Notice the details and hidden images in the tree and background, some which on a label have to so small as to be very difficult to discern. True, the style is wholly different, and the subject is far more figure-oriented, rather than the landscape focus of Sierra, but you can see how the earthtone color palette heightens the sense of connection to nature, and doesn't seem at all jarring when put next to the Life and Limb artwork. Now, I have no idea if this is intentional. The new work at both breweries seems consistent, and I can't see any significant departure for the purposes of the collaboration work to indicate it was a specific effort to match up styles. Perhaps the similarity in styles is more a symptom of two breweries that share similar values. As high-profile, established, relatively large craft breweries on different coasts, one could easily see how Dogfish and Sierra could have similar needs to refresh their looks and re-establish values. In this sustainability-happy environment, especially in a sustainability-friendly industry like craft beer, these looks could just be a very understandable confluence of similar values resulting in similar styles. Very cool take on the Session topic - thanks for going in that direction. As a visual arts fan, I always love seeing the art of products being discussed.